Hard to say why but it’s hard to find kids who want to stand on a dusty hay wagon on a 95 degree day and handle a few hundred bales twice. But it’s time to cut hay. And I’m massively allergic. I’ll spend days coughing, sneezing and wheezing after riding the wagon behind the baler. But this year it’s not so bad. My son, at age 12, rode the wagon. I stood back and watched him succeed. Since he can do that, I can spend more time eating berries. I was caught red-handed. Mulberries were juicy! 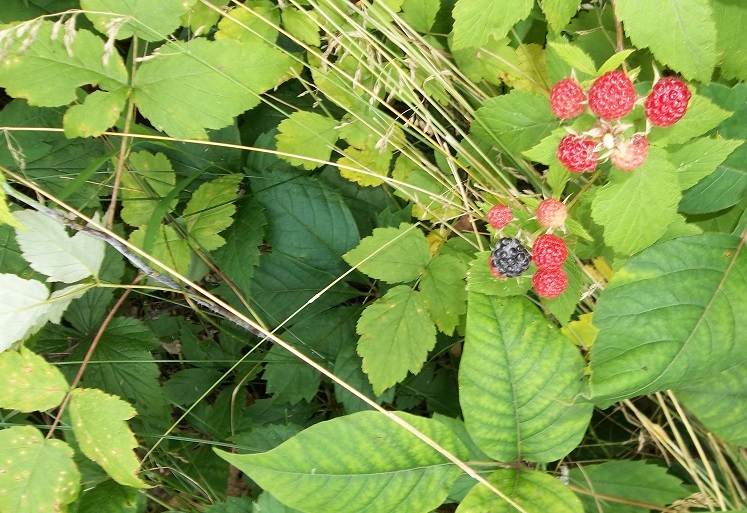 It gave me time to reflect on what we are doing, why we are doing it and how to get that last sweet dewberry out from under the poison ivy leaf. Good luck with that. 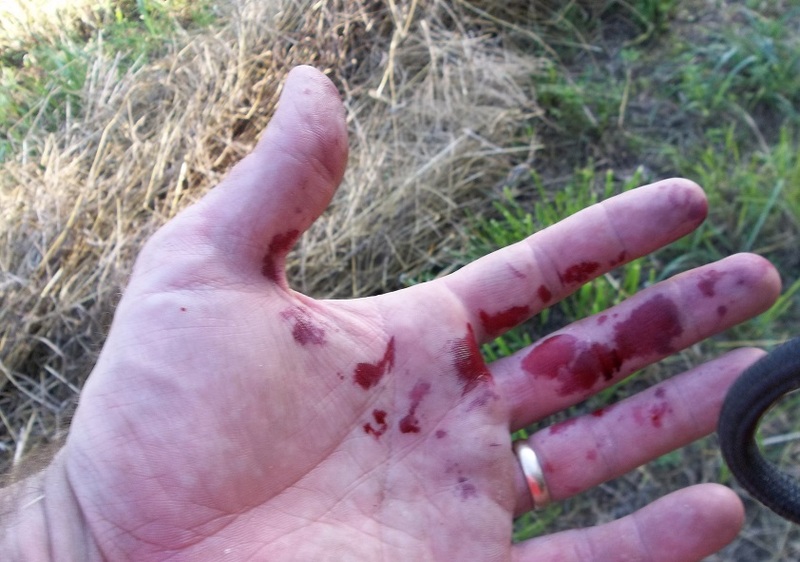 Maybe I should stick to mulberries. Either way, the days of putting up our own hay may be numbered. 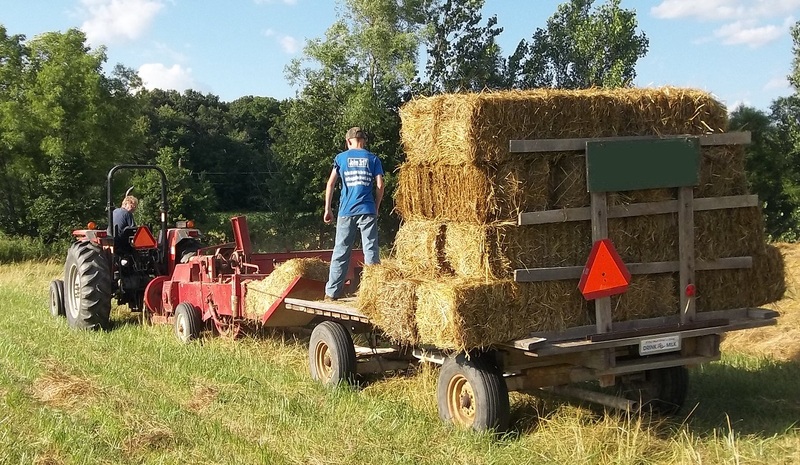 This entry was posted in Children on the Farm, Farm Equipment and tagged Alfalfa Hay, Hay. Bookmark the permalink. The hayfield pictures sure brought back memories. I worked the Chism hayfields a few decades ago with my brother Jerry. It would probably kill me to try this now. Just this week I’ve been scanning old photos of my daughter for a post like this. If your kids decide to continue farming, they will probably have an easier time than you since they are there being steeped in the day to day workings. I have fond memories of throwing hay bales up on the wagon as a 10 year old. Being from the suburbs, I didn’t know that hay cuts like a knife. Many itchy arms later, I learned my lesson. I hope my kids get to experience that excitement too!